Located in the Endeavor Hills in the centre of the northern part of the island, Cactus Hill has spectacular sea views to both the east and west sides of the island. It is close to the pristine sandy beaches at Serenity and Macaroni Bay, as well as the island's tennis club and equestrian centre for riding enthusiasts. To the west side of the island, the island's yachting port is conveniently close at Britannia Bay. Cactus Hill was completely renovated in 2011. 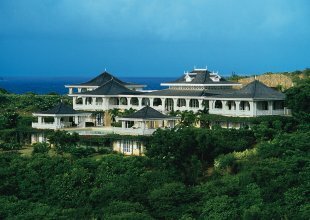 Cactus Hill is built in colonial-style, arranged as a quadrangle around beautifully landscaped gardens incorporating a stream and waterfall. Surrounding an oval-shaped pool, broad sun terraces provide a perfect venue for sunset cocktails. Cactus Hill is arranged as a quadrangle around a lush central garden, with stream and even a waterfall featuring in the grounds. 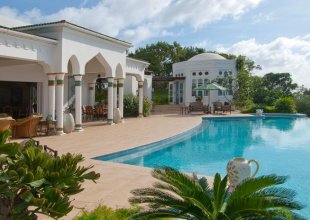 From its raised position, the villa has spectacular sea views to both the eastern and western sides of the island. • Landscaped gardens form a tropical backdrop which surrounds the property, at the centre of which are an oval-shaped pool and sun terraces.